Along with keeping fit, I do like to try to eat healthily too but I do love baking so it is hard to combine the two. 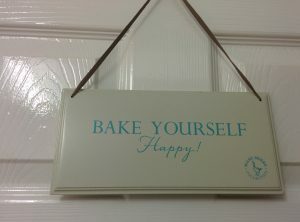 I have decided that I will bake once a week as it makes me happy but try to be strict with myself. I will try to find some healthy bakes along the way too. I was overjoyed when I got home from work last Friday to find this package waiting for me. 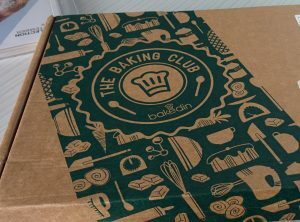 Kathryn’s boyfriend, Aaron has subscribed to this for me for my birthday and as I had already received three boxes, I had thought the subscription was finished. 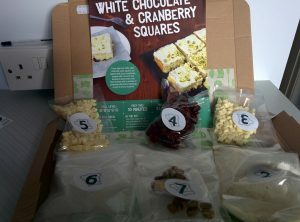 I opened up the box and liked what I saw – a recipe and ingredients for white chocolate & cranberry squares. I checked the ingredients that I needed to add – butter, eggs and milk; all items that were coming in my food shop on Saturday so I knew I could make them on Sunday. Each card does contain the skill level, preparation time and baking time on. The skill level was two chef’s hat so I was confident this would be easy. I decided that I wouldn’t use my kitchen gadgets but use the good old fashioned kitchen bowl and a wooden spoon. I did actually have it prepared in the 10 minutes that it said and I soon had it baking in the oven. 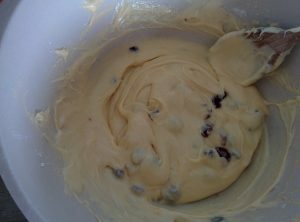 The mixture actually contained melted white chocolate and cranberries. The smell was incredible. 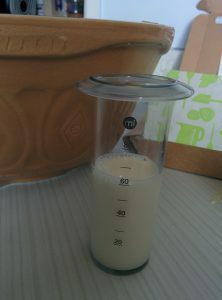 Whilst I didn’t use my kitchen gadgets, I did use this nifty container from my food processor to measure the small amount of milk I needed. My normal jug was just too big. 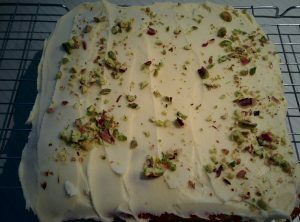 I took it out of the oven and whilst it was cooling I made the butter icing and bashed the pistachios with a rolling pin to go over the top (okay it said roughly chop but this worked well) . Once again I was adding melted white chocolate to the butter cream and I have to say I was a little concerned. I thought that all the white chocolate would make it too sweet. With this in mind, I cut the cake into 16 pieces. I could not wait to try it so was very keen to have a cup of tea after my dinner so I could try a piece. I should not have worried about the sweetness at all. It was delicious. I am not ashamed to say I was not strict with myself and enjoyed every piece I ate. I am enjoying baking with these kits as the ingredients are ready for you to bake with so I plan to keep up the subscription for another year. Super duper delicious! We should find healthy baking finds together!